(Greg Moran, The San Diego Union-Tribune) In a forcefully worded ruling, a federal judge in San Diego on Friday struck down a state law banning gun magazines that hold more than 10 bullets, handing gun rights advocates a sweeping victory. U.S. District Judge Roger T. Benitez ruled that the California law violated the Second Amendment rights of gun owners and issued an injunction barring state officials from enforcing it, invoking the nation’s Colonial past as well as recent cases from around the country in which gun owners ran out of bullets while confronting intruders in their homes. He concluded that the state law effectively made criminals out of ordinary citizens and was an overreaction to high-profile gun crimes. The ruling may not have come as a surprise because Benitez, an appointee of President George W. Bush, in 2017 had granted a preliminary injunction stopping enforcement of the law — a decision upheld last July by the 9th U.S. Circuit Court of Appeals. Chuck Michel, president of the California Rifle & Pistol Association, which filed the suit along with several gun owners, said the ruling reaffirmed gun-owning rights. 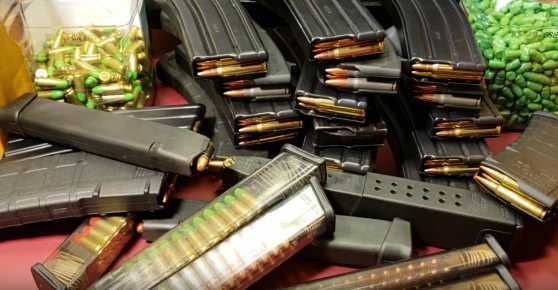 “This comprehensive and detailed ruling recognizes that these magazines have great value as self-defense tools, and confirms that the government bears a very high burden to justify a law that infringes on the right to keep and bear arms,” Michel said in a statement. The state attorney general’s office said in a statement that it was reviewing the ruling. The lawsuit was filed in 2017 on behalf of gun owners who either wanted the magazines for self-defense or already owned them and didn’t want to be forced to give them up. In his 86-page opinion, Benitez concluded that larger-capacity magazines are “lawful arms” under the Constitution and said the state did not have a strong enough reason to infringe on the constitutional rights of gun owners. He said the magazines are used for self-defense and are legal in 41 states and under federal law. State law for years had banned selling or buying large-capacity magazines, though people who owned them were allowed to keep them. In 2016, the state passed a law that banned possession of the magazines, which led to the lawsuit. In addition to determining the law violated the Second Amendment, Benitez also said forcing residents to give up lawfully acquired magazines violated the Constitution’s ban on taking property without just compensation. In the opening pages of the ruling, Benitez recounted three instances of home invasions. In two examples, women fired at the intruders but ran out of bullets. In a third case, a woman fired multiple rounds with a gun in one hand while she held a phone in the other to call police. Benitez ended his ruling by harking back to the nation’s founding. The issue may not be fully resolved because judges in other states have issued different rulings, potentially setting up a scenario in which the U.S. Supreme Court would have to ultimately decide.